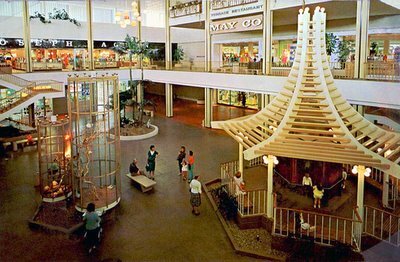 Hi there -- I'm writing an article for Retail Traffic magazine about bloggers who focus on dead malls and the history of malls. Your blog is widely admired, and as a result the article wouldn't be complete without an interview with you, Mr. Milford. I've e-mailed you a few times but have not heard from you yet, and my deadline is Thursday (Nov. 2), so an interview today or tomorrow would be most helpful. 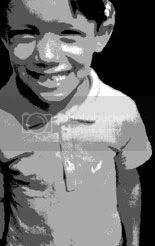 Please e-mail me at m_janssen (at) mac (dot) com -- thanks! I love the unusual gazabo! Love the birdcages!! I also just noticed the Joseph Magnin's.. darn, I thought I was the first to discover it!! This is a GREAT photo. Truly a classic mall. Thanks for the comments, guys. I agree the bird cages and gazeebo are killer! I need to find some closeups of those. 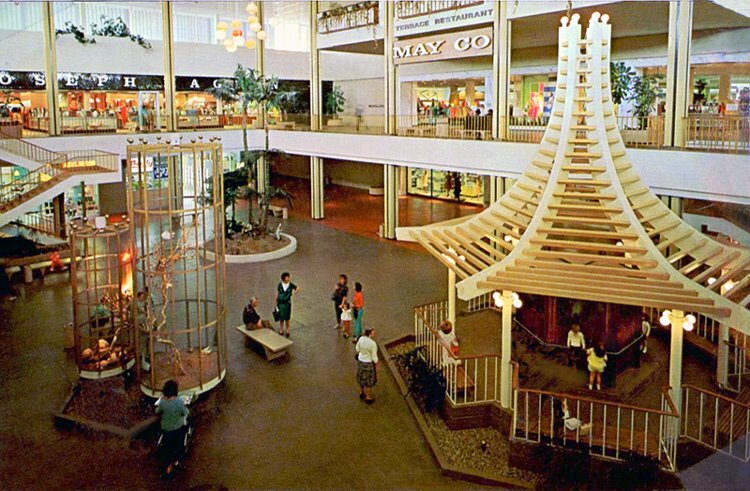 Its incredible how different this mall is today. The May Company was partially damaged in the 1994 Northridge quake and rebuilt. I dont know what happened to the restaurant. Cool picture. I work near by and go to that mall at least once a week. It just recently completed a $300 expansion that added over 100 new stores. The Josphen Magin space is currenty occupied by a Shoe Pavilion and a vacant Lane Bryant (it moved to the new section). Actually there was an oil dripping from the mono-filament strings. It was sad when this feature disappeared to be replaced with kiosks to sell more product. Does Topanga Plaza still have the ice skating rink? In 1966 I worked at the food court which was called "Don Paul's Seven Kitchens". The ice rink was next to the food court and I use to enjoy watching Olympic Gold Medalist, Sonia Henie ice skate to stay in shape. She was 54 years old then and died in 1969 of leukemia. Progress is what it is, but Topanga used to have such a home-like feel.. a bit colder now. The rink was removed in the early eighties (I remember it when I was a really little kid, and I was born in 1976) and replaced with the food court. The link in the comments above shows a good shot of the food court in the 90s where the ice rink was.. If those windows above Joseph Magnin could speak, I and my friend Mike would've been in a lot of trouble. We were 12 and 13, lived across the street and FORT TOPANGA was our domain. We knew every telephone number of every telephone panel, all the secret passageways, three ways to the roof and how to cut holes in ceiling tiles to watch 7 kitchens patrons 40 feet below. Mike, I'm surprised we're still alive. What a great memory of early Topanga Plaza, 1967. Although long lost, I am saddened by the loss of my 1966 picture of Sandy Koufax shaking my hand during a meeting. This happened at about 9 PM at a PACKED event for charity. I think it was held by Debbie Reynolds and the public was invited. Topanga had those round kiosks and some were mobile. They set one up about 15 foot away from the Pickwick Book store and I watched as SANDY walked into one of the kiosks and started signing autographs. I got one and the picture. Both had been stolen when I left the Navy and the Navy van used to ship my goods home was stolen in Las Vegas. My father built this pagoda. I was a little kid when he built it. We lived in Woodland Hills off Topanga Canyon Blvd.